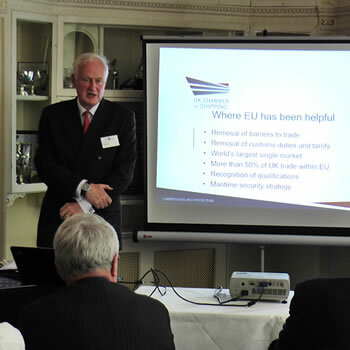 The Maritime Foundation, the leading organisation promoting the UK’s interests across the maritime sector, held a top-level briefing entitled The EU, Britain and the Sea – Fisheries, Shipping and Maritime Security. The overall message is that whatever the outcome of the UK referendum on the EU, both Britain and Europe must wake up to the value and vulnerability of its vital maritime sector in the rapidly changing and increasingly dangerous world of geo-politics. 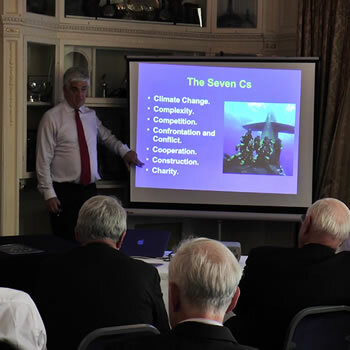 The briefing, at the Naval Club, Mayfair, London, was organised to heighten awareness of the maritime dimension. Around 50 distinguished experts gathered to discuss a wide range of subjects all linked by the sea and European policies. Julian Parker OBE, Chairman of the Maritime Foundation, opening the briefing stated that: “World Oceans Day was held yesterday, Wednesday, 8 June with the theme this year Healthy Oceans, Healthy Planet. “This international initiative received almost no coverage in the main national newspapers and illustrates the low priority assigned to maritime affairs in this country in spite of it claiming to be a maritime nation. “The sea is vital to Europe just as it is vital to Britain. It is the principal medium of international and inter-regional trade. The seas around Europe sustain an essential resource of fish and shellfish which supports a major fish processing industry: so maritime security is a vital issue too. 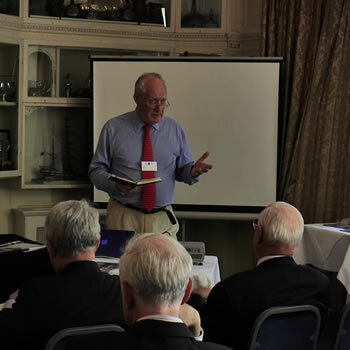 Strategic adviser Rear Admiral Chris Parry CBE graphically and robustly addressed the growing problems of maritime security facing the UK and Europe across the world. 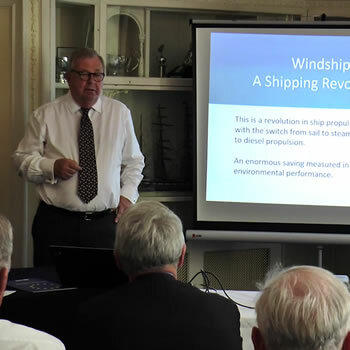 “Where the EU is unhelpful is with burdon some regulations: so for example in the international shipping market ship owners cannot afford EU rates of pay in spite of owner union agreements. Under these conditions the only option for owners is to flag out. “The EU is now making a third attempt to regulate port services when they are not needed, being already well run. Likewise, it is trying to regulate passenger liner and ferry operations, and introducing yet more unnecessary environmental regulations, which are unwanted. 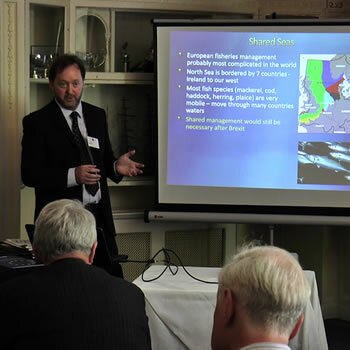 Rear Admiral Chris Parry CBE said: “There’s a world of opportunity in maritime security which the EU in the past has not taken seriously, although individual countries have sufficient heritage and expertise regarding the sea. “There are now four or five empires in the world. Europe is a maritime continent, it’s a huge peninsular, but unless it gets its act together the continent will become a backwater in a constantly globalising world. “The most overlooked key statement in the new accord between Russia and China to bring their twin resources together are ‘modernisation and mobilisation’. “Their stated their commitment is to global de-Americanization, the recovery of rights and aversion to the current rules, plus setting up alternative trade and economic systems to by-pass the West. “By 2025, the Russian rearmament programme will match NATO forces. The freedom of the seas is under threat from China. Russia is also land-grabbing as the Arctic ice recedes and China has said the traditional mentality that land is superior to sea must be abandoned. “There is no EU position or policy on these crucial matters, and there’s been a total breakdown on immigration strategy, in spite of warnings for more than 10 years. By 2025 Europe will be on the edge of Columbus’ flat map. Peter Hore naval correspondent said the EU has not developed the necessary core functionaries. “Our representation within the Commission is very small because most of our civil servants are not linguists,” he said. “We are a nation financially dependent on free trade and immigration, with a steady supply of new labour. The problem of the EU is a democratic deficiency. Who can name their MEP? “NATO has prevented war in Europe, but we cannot ignore our relationship with the US, which has an amazing ability to reinvent itself as often as Madonna! Dr Bryce Stewart, of the University of York, said the Common Fisheries Policy (CFP) was the subject of huge criticism, but was responding to change: “Why abandon the ship when it’s improving? The biggest decline in UK fishing fleets was before the CFP and non-EU member Norway’s fleet has also halved. Lars Carlsson, Windship Technology director, said that of the crises affecting the world, the most serious is emissions: “If we don’t do something about it nature will do it for us. “By combining the opportunity of a shipping crisis with low ship prices, the conversion of vessels to wind power will save 30 per cent fuel and cut emissions compared to conventional ships. Will the outcome of the In/Out Referendum turn the British Lion into a toothless pussycat inside an unreformed EU? A pussycat whose interests can be ignored in a headless rush towards ever-closer political union? Or will the British Lion become a wild cat outside the EU, free to pursue policies tailored to its interests? Results from a straw poll based at the conclusion of the briefing on how delegates intended to vote in the EU referendum were: 53 per cent to remain in the EU and 47 per cent to leave. The briefing is one of two main national regular events organised by the Maritime Foundation, with the next being the Maritime Media Awards, in London, on 25 October, 2016. The Maritime Foundation promotes Britain’s interests across the entire maritime sector. Its purpose is to inform and raise public and parliamentary awareness of the importance of Britain’s maritime industries, commerce and defence through education, training and research, as well as through the Foundation’s annual Maritime Media Awards. The Maritime Foundation promotes Britain’s interests across the entire maritime sector. Its purpose is to inform and raise public and parliamentary awareness of the importance of Britain’s maritime industries, commerce and defence through education, training and research, as well as through the Foundation’s annual Maritime Media Awards. The information you provide will enable us to respond to your enquiry. It will be shared with the relevant team member who can assist with your query and will not be used for any other purpose. We respect your privacy and will not disclose any identifiable information collected on this website, and it will not be shared with any third party unless when there is a legal obligation to do so.